NCAA Basketball Tournament Has Gone to the Dogs. Tonight’s NCAA basketball tournament for the national championship is being billed as a dog fight with Butler U as the underdog against UConn, who has 10 straight tournament game wins under their dog collars. But that’s not the whole story. It’s the University of Connecticut (UConn) Huskies versus the Butler University Bulldogs tonight in the men’s final four basketball tournament. And unless some miracle occurs, like dog bones raining down from the sky, it looks as though only one of the two real dog mascots will be on the sidelines tonight. And The New Barker dog magazine is calling a furry foul on game day. 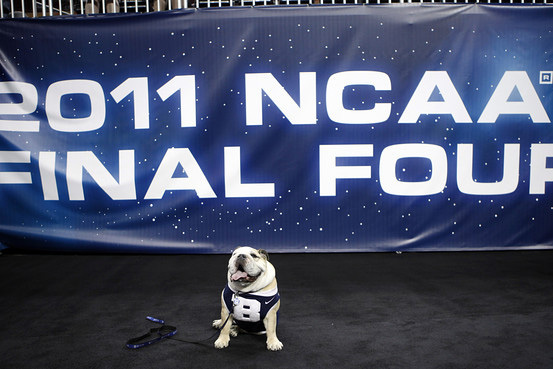 Blue II, the seven-year-old English Bulldog and mascot for Butler University was granted a waiver by the NCAA that allows him on the court for the game. 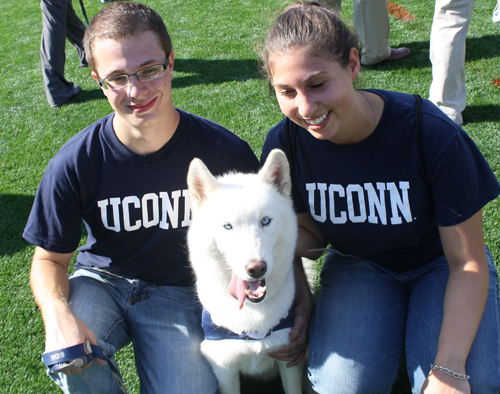 UConn’s mascot, Jonathan XIII, a white Siberian Husky, apparently has not been granted the same waiver. While Blue II was flying first class to Texas last week, Jonathan XIII had to read about his rival’s travels via the newspapers lining the floor of his kennel. Maybe Blue II has a better publicist. He is definitely getting major face time on television. On Saturday evening (pre-game against Virginia Commonwealth) after posing with cheerleaders, he sat next to Charles “I am not a role model” BARKley. The jury is still out on who barked louder – BARKley or Blue II. The dog’s handler, Michael Kaltenmark said that Blue II knows when to put his game face on, and is ferocious on the court, yapping at the opposing team’s players. The game tonight for the national championship is a showdown between two of the hottest teams in the country. It’s being billed as a dog fight with Butler as the underdog against UConn, who has 10 straight tournament game wins under their dog collars. Two questions remain to be answered: How much camera time will Blue II receive tonight during the game? And will APO fraternity figure out a way to sneak Jonathan XIII onto the court? We double dog dare you. Previous Previous post: TODAY-2ND ANNUAL DOGS’ DAY IN DADE CITY. Next Next post: PUG FAIRE IN LAKELAND TOMORROW.